As I mentioned in previous posts, self-harm has been in existence for quite some time. And although almost anyone about my age has at least heard of the idea, when my parents first learned that I was self-harming the action seemed extremely obscure to them. I asked them about it and they said growing up they had never heard about it. They could barely recall even knowing other kids with depression. Although more mental disorders are diagnosed nowadays, they very well existed before. So why does the idea seem so new? I would say this can be attributed to the media. Even if we don’t purposefully go out of our way to find it, even if we don’t pay full attention when it comes up in whatever we’re reading, the words or images alone can give us the general idea that it exists. I would argue that the media can have a pretty negative impact on the reputation of self-injury and on the individuals who engage in such behavior. 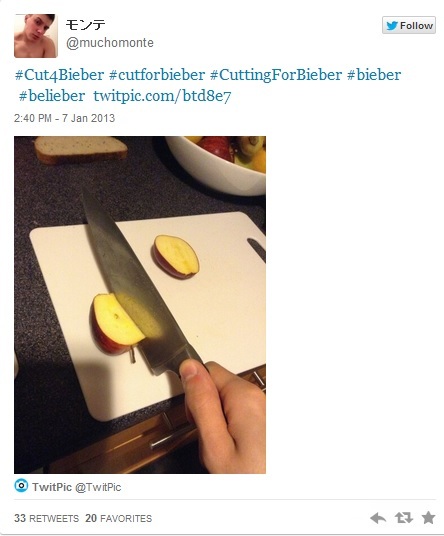 One event that sticks out in my mind is the #Cut4Bieber hashtag that went viral over Twitter earlier this year. Apparently the whole fiasco began as a practical joke on 4Chan. The motivation can be unclear (what sources can you believe if you want facts in regards to a social media post? Furthermore, it is difficult to read levels of sarcasm or jokes simply over text). In my opinion the motivation accounts to just a fraction of the severity. The posters may have actually wanted people to start harming themselves. Or perhaps it was solely a joke to mock the idea that people may be extremely influenced by the actions of a celebrity. But still the same it mocks self-injury. It lumps self-injury into the realm of attention-seeking actions. Screen shot of the alleged 4Chan post initiating this frenzy. Gory image removed. Basically the madness began with individuals posting gory cutting photos (either staged images or legitimate wounds that had been publicly posted prior) on twitter accompanied by a caption begging the teen star to stop smoking marijuana or else they would continue to hurt themselves. 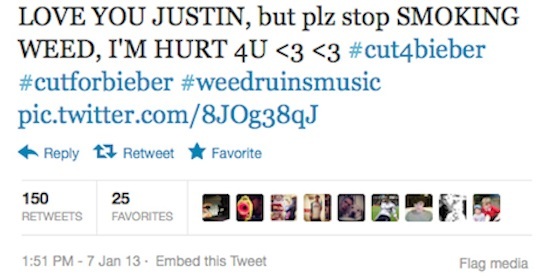 Begging Justin to stop smoking. Gory image removed. 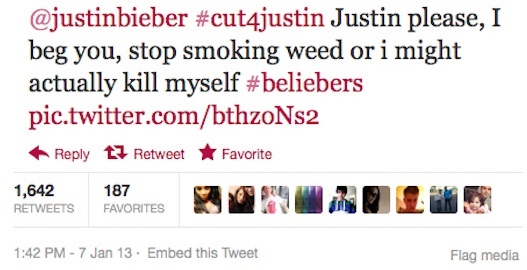 Threats of suicide. Gory image removed. There were a few common reactions to these posts. Some people completely ignored them. Others were angered that such negative ideas were becoming viral. Still others retaliated, insulting anyone who would cut over such an issue or sometimes joked back with their “creative” spin-offs on cutting. In my own opinion these replies can be just as bad as the original posts. Although the originals supported this habit, they were indirect being that they we written by a supposed cutter. The replies, however, are more direct. They attack and ridicule self-injury. Sure, sometimes they can be witty. But from the standpoint of an individual fighting the urge, it can be like rubbing salt in a wound. I can’t be pessimistic and say all media attention is bad when it comes to the topic of self-harm. In some instances it is quite the opposite. It is becoming more and more common that celebrities share their stories of abuse, drug/alcohol addiction, eating disorders, self-injury, and the like. Due to their popularity they can potentially reach a large audience. One celebrity that comes to mind is teen star Demi Lovato. She began her career as a child actress and became popular through the Disney Original Movie Camp Rock. Since then she has also become a singer/songwriter/musician. But her self-harm has followed her through her journey to fame. It makes sense to most people for someone to have terrible self-esteem while they’re being bullied. What is harder to grasp is that people can have equally terrible self-esteem even if everything else in their life seems to be going wonderfully. As Demi journeyed into stardom her problems didn’t just pack their bags and leave. If anything the issues increased. Her career demanded very much of her and even if from the outside it appears that she gave it her best, inside she constantly worried about pleasing everyone. Unfortunately, not everyone her worried about her. Her eating disorders and self-injury worsened as her way of coping with all the stress. But still those around her demanded more. Luckily her family and close friends finally realized she needed help. Demi checked herself into an institution and discovered that she was suffering from bipolar disorder as well as anorexia binge-purge type. Demi is currently recovering. She has been a very avid activist against bullying. Bullying has damaged far too much self-esteem and can have lasting effects on the life of the bullied. I’m not much of a Disney fan, and I don’t think Demi’s music would be the kind of genre I like, but I have really grown to admire her because of her dedication to turning her downfalls around to reach out to others. As demonstrated by these two examples, the media can be extremely negative or extremely positive in regards to self-injury awareness. Hopefully my blog and others like it can contribute to the positive media influences, to help those struggling as well as informing others. I apologize for being extremely late with this post. It’s been rough and due to the touchiness of this blog I don’t like to write anything when I’m not in the right frame of mind. Hopefully I shall be able to stay on track better in the future! Thank you to individuals following my blog (and putting up with my lateness) as well as to newcomers! Every viewer is appreciated!